Who could tire of life? Good for him, living out his fantasy. He does know that Nixon was guilty, right? I think it's probably an observation from Chapo, but all of these conservo shitheads think hollywood mafia characters are, like, the pinnacle of manly achievement and they fancy themselves of a kind. An enlightening window into their psyches, imho. One of the satisfying themes of season 2 of Fargo was that erosion of the old family business in favour of corporate management, from the personal to the abstract, that Reagan's victory signaled. So it's ironic that people like Stone and Trump romanticize that family mob archetype when they are part of a generation that has done so much to elevate the tyranny of accountants and algorithms as America's business model. *snicker* You're sullying the good name of Richard Nixon by false association! Hold on, now! We've yet to hear from any Family Ties showrunners that he wasn't the real-life inspiration for Alex P. Keaton. I want this to be true. I accept that this is true. Ugh, he went to my alma mater? I hate my alma mater. 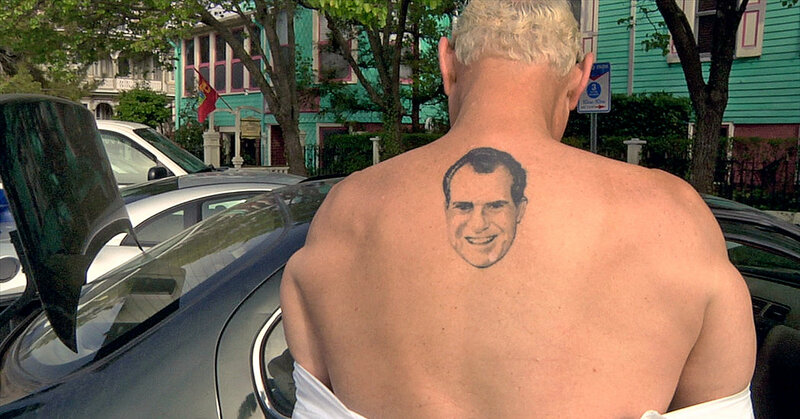 But you feel awkward about your Nixon tattoo now!